3 bedrooms / 2 bathrooms, sleeps 6 comfortably. 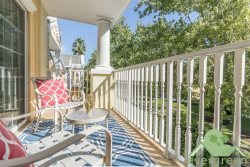 1/23: Welcome to Butterfly, a charming 3 bed/2 bath first floor condo close to the pool in Windsor Palms Resort. Property Size 1,268 sq. ft.
A 3 bedroom home, with 2 full bathrooms, this first floor condo is very nicely furnished with your comfort in mind. Being on the first floor, Butterfly Palm is one of only a few condos available for rental that can boast this feature and is already proving to be extremely popular with our clients. Located just steps from the main Windsor Palms pool and clubhouse, Butterfly Palm enjoys a prime location in this great resort too and has much to recommend it. Butterfly sleeps 6 people comfortably, the bedrooms consisting of 1 Master bedroom, with a King size bed and a full bathroom en-suite, and 2 twin size rooms. It is worth noting too that all the bedrooms have cable as well, and all have flat screen televisions too. Butterfly has high-speed wireless internet access as well, offered free of charge to all guests. The kitchen is fully equipped as you would expect of a home of this standard, with a dishwasher, microwave, full refrigerator, stove, coffee maker, blender, toaster, waste disposal and telephone. All linens and towels are supplied for your stay in all Evergreen homes, with all kitchen utensils and crockery provided too. There is also a hair dryer in each home, and an iron and ironing board as well. Sliding patio doors from the living area lead onto a small screened balcony with a resort view, while exiting from the rear end of the building will bring you out near the Windsor Palms main pool and clubhouse, with the tennis and basketball court, and a children's play area right there too. With no stairs to negotiate, 3 bedrooms in a spacious condo, and a location just steps from everything this fine resort has to offer, Butterfly Palm has a lot going for it and represents great value for money starting at just $79 per night!. *Please remember that all our homes are non-smoking, and we have a strict no-pets policy as well. We also remind you that we offer baby items, BBQ's, mid stay cleans, welcome baskets too, and through our friends at Kissimmee Guest Services a range of discounted attraction tickets. Please ask for more details if interested in any of these services. Windsor Palms is a very popular resort, and is extremely well maintained. A gated community, manned 24 hours a day, Windsor Palms boasts a whole host of amenities, including a large clubhouse containing a games room, fitness room, and sundry shop with a large community pool and spa within the grounds. Tennis and Basketball are also available here, and there is a very nice play area for children too. Windsor Palms is located just off Formosa Gardens Boulevard, about 1 mile from the US192, right in the heart of the Disney area. Walt Disney World is just 3.5 miles away, Universal about 14 miles, and Sea World just 10 miles. There are a host of shops and restaurants very close by too, and the famous Florida Mall is about a 25 minute drive..
Clearwater Beach is about a 90 minutes away to the West, Cocoa Beach the same distance to the East, and you can get to the wonderful Kennedy Space Center in just over an hour. The resort does have a Shuttle service available to all the areas main attractions and airports, though charges will apply. Details are available at the clubhouse. Butterfly Palm is a very homely condo, light and airy as the name would suggest, and given its appearance, location, and the superb facilities available in Windsor Palms Resort, it is likely to become a very sought after unit.